1. What are the benefits of using RPA? Since it can automate almost all manual and repetitive tasks, you can reduce the size of your workforce and hence reduce costs. To err is human, but computers or machines don’t commit any mistakes, they do exactly as they are told and hence are more accurate. Like earlier stated, there is no coding required. Any automation can be created using a simple drag and drop. RPA can be implemented to automate any repetitive process which is done on a computer. This process can be related to any desktop tool or web application, if the process is repetitive it can be automated, that too with minimum coding required. 2. What is the Delay Activity in UiPath? Uipath uses the delay activity for making you pause or stop the automation for some period. This is mainly used in projects where you need good timing like waiting and then start of some particular applications or waiting for information processing which you can use in the different activity. 3. What are the characteristics of RPA? RPA doesn’t require programming skills. Employees with any subject expertise can be trained to automate RPA tools instantly. The whole work revolves around RPA chart which provides a flowchart designer to graphically link, drag and drop icons to represent steps in a process. RPA adoption originates within business operations rather inside IT departments. RPA projects require less IT skills and less investment. Eventually, the automation is lowered at a substantial rate. Non- Disruptive: RPA avoids complexity and risk. The software robots access to end user’s systems via a controlled user interface, hence reducing the necessity of underlying systems programming. 4. What is package manager in UiPath? With the help of package manager, you can easily download the activity packages, frameworks, libraries, wrappers etc and you can also check the ones which are already present in the container and you can also update them or add or remove them. All these features are only possible because of manage packages window which you can easily open by clicking the package manager button by pressing on the activity panel. 5. What are the important Phases of RPA Life Cycle? The first phase in RPA begins with analysis. Business team and RPA Architect work together to understand the business process for RPA development. RPA developer (Team) starts working on the requirement in their environment possibly a distinct development environment. Some companies conduct Testing by Separate Testing Team, while some have a dedicated testing team which performs a dedicated QA like normal SDLC flow. Best Practice is to have a dedicated testing team which performs QA of a developed bot. After the Development and Testing phases, a bot is ready for distribution and enters the maintenance phase. This question is frequently asked in RPA interviews. You should know the RPA Life Cycle. 6. What is Automatic Recording in UiPath? Automation recording is used as they are very much useful plus it can save you a lot of time. As this automatic recording will provide a skeleton of the entire business processes so you can easily parameterize and customise the project. 7. How is a chatbot different from robotic process automation? A bot programmed to chat with a user (human) like a human. Possibly to recommend a pre-learned resolution to a particular problem that user faces or to take a request and instruct backend systems to provision a request. A bot programmed to automate a manual business process of executing a task or an activity within a business function. A business function can be like HR/Finance/Procurement etc. A chatbot can be a medium to feed an input into an RPA engine but cannot replicate the features of an RPA engine. 8. What is Citrix Automation in UiPath? Do you have any experience in virtual machine automation? The virtual machine is the emulation of the computer science. If you efficiently want to process the automation in the Citrix machines then you will need techniques and tool. The Citrix automation in uipath is used for operating the virtual machine. Yes, I have worked on the virtual machine automation previously. 9. What is the difference between traditional / IT automation and RPA? Traditional IT Automation is long drawn and requires considerable manpower, time, effort and substantial cost. RPA is a quick fix to instantly generate improvements. Both traditional automation and RPA need solid strategy and planning but the implementation of RPA is quick. While both are aimed towards the common goal of Automation, RPA is faster, better and cheaper than traditional automation. Therefore Traditional Automation is a strategic move and RPA is a tactical move. 10. How can you enable image and text-based process automation? 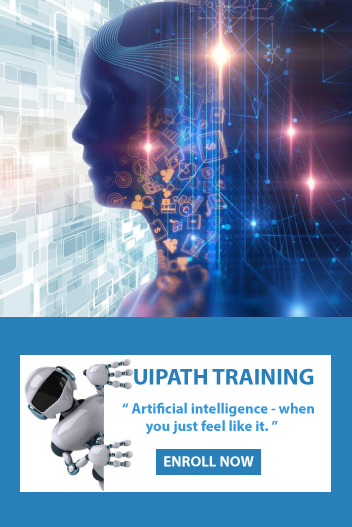 If you want to enable the image and text-based process automation, you will have to see that the uipath has some features that will simulate the keyboard or mouse input, like hovering, clicking, text recognition, OCR activities etc that helps for identifying by UI elements by screen scraping. Image or text automation is basically used in the situations where the UI automation won’t work like in the environment of the virtual machine or in the places where finding selectors by using the normal methods is not easy.